Everything we do today is in the company of others. We take group trips to foreign locales, go bar-hopping with the squad, even practice downward dog with a bunch of complete strangers. I’ve tried to embrace this communal approach to life, but in reality discovered it was not as satisfying as my perfectly filtered photos appeared to be. So this time, when I travelled to Sri Lanka, the palm-fringed island that most visitors believe is a reincarnation of ’90s Goa, I didn’t bring anyone with me. Sri Lanka’s tiny airport happens to be crammed with surfers, honeymooners and hippies discussing kundalis. When I step out, the tropical weather jumps at me like an excited old friend. 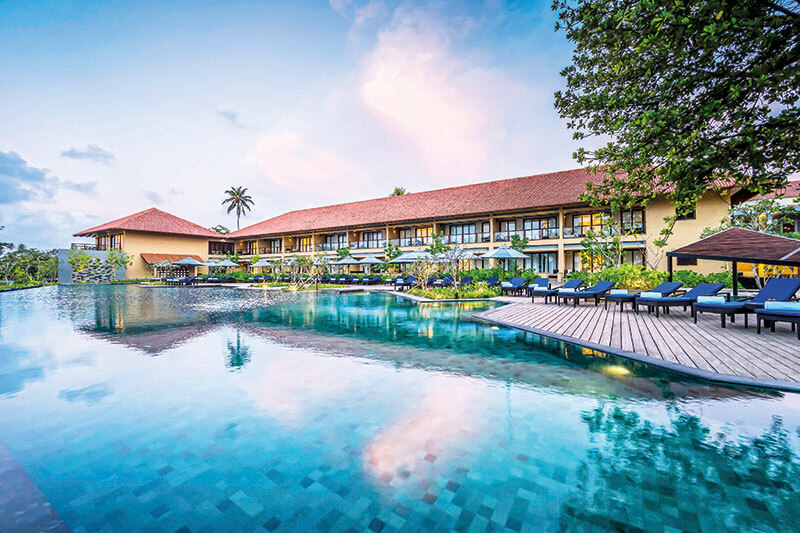 After an hour-and-a-half drive, I reach the sprawling Anantara Kalutara property, and set out to discover the villas that hide behind a lush canopy of palm trees. Inspired by the designs of the famous architect Geoffrey Bawa, the hotel overlooks the peaceful Southwest coast, perkily placed between the Indian Ocean and the Kalu Ganga river. The entrance has narrow corridors that lead to a high-ceilinged cottage. I walk up the wooden stairs to find an old-fashioned library dedicated to the works of the late architect, including an archive of his famous drawings on Batik. The staff tells me that Sri Lanka’s ex-captain Sanath Jayasuriya had spent the weekend here. Each of the 141 rooms at Anantara Kalutara showcases a cultural side of the destination, often lost in the touristy exploration of Ceylon teas and nature trails. I explore its weaving traditions through handwoven tapestries that adorn my room, a mini courtyard with colonial architecture and wood carvings by Sri Lankan artisans. The Ocean Villa, as it is called, is enormous enough to accommodate a velvety garden terrace, a private plunge pool and a sun deck. And from any room on the property, you will be able to see the ubiquitous skyline of coconut trees. Forty minutes away from this property, is another ecological marvel — Geoffrey Bawa’s larger-than-life gardens in Lunuganga. While he conceptualised enduring architectural forms like those at Anantara, the tour guide tells me that this secluded estate happened to be his muse. I try to photograph the secret garden on my phone, but sigh knowing that even the 12x zoom lens fails to really capture its wonder. I pass through curvaceous bonsais that were fashioned by the architect himself using strings and stones. He purchased sculptures from Rome and Greece, now encroached upon by shy creepers; cherubs appear at occasional spots, and a frangipani tree (his favourite) stands at the centre of it all. Afternoons in Sri Lanka can be quite blazing. On returning to the hotel, I am greeted by the famous king coconut. Orange in colour, the refreshing drink has hints of tangerine and it is something I continue to crave, long after I have returned. We have lunch at Olu, a restaurant that serves local cuisine on the property. On request, a plate of assorted condiments accompany a bowl of lagoon crab curry, which reminds me of my grandmother’s back home. I hate to admit that it may have tasted even better than hers. The next morning, I set off to another Anantara property which is 180 kilometres away, on the southernmost tip of the island. My three-hour journey is spent in the company of the driver, Malaka. Like most Sri Lankans, he is overwhelmingly friendly and eager to chat about life. 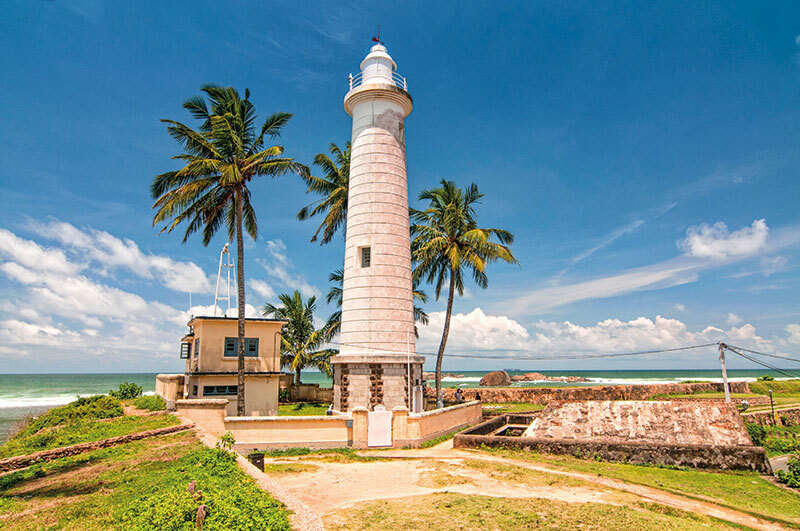 En route we halt at Galle Fort — a UNESCO World Heritage Site that houses the remains of 500 years of colonisation by the Portuguese, British and Dutch. Built by the latter in 1663, the 36-hectare fort is surrounded on three sides by the ocean, and boasts of the colossal Dondra Head lighthouse. The cobbled streets hidden between the ramparts are home to art galleries, little boutique shops, cafes and hotels — all owned by expats, artists and photographers. When I ask Malaka, “Where can I get souvenirs in Galle?” he is quick to respond with, “Gold? You get the best gold in Mumbai!” I figure that the Sinhalese-speaking folk often misunderstand the English language, but are quick to catch up. So minutes later, based on his recommendation, I find myself looking at endless looms of handwoven cloth, intricate carvings and traditional wooden masks. Just before sunset, I arrive at Anantara Peace Haven in Tangalle, hidden on a rocky outcrop of the southern coast. The 21-acre property, which was originally a coconut plantation, is large enough to house a lake that ultimately intertwines with the gold shoreline. 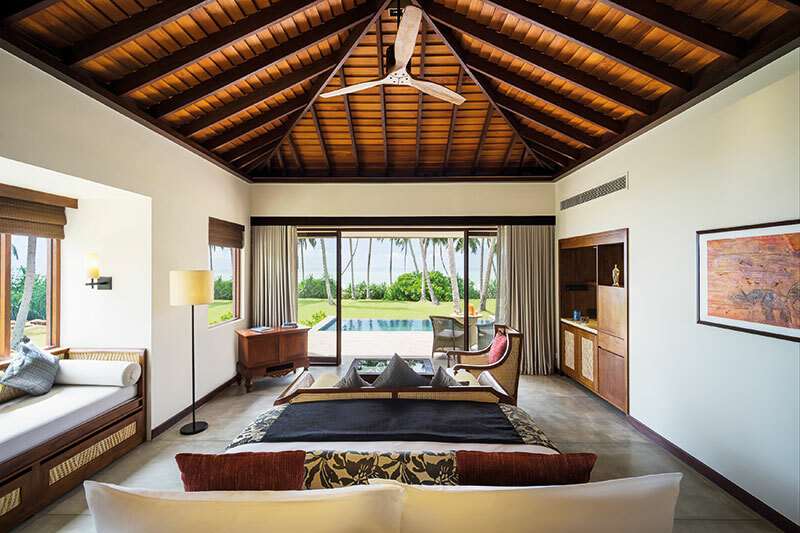 Dotted with luxury villas, each one is meticulously conceptualised with raw silk furnishings and wooden interiors. The walls are lined with paintings and charcoal sketches by local artists. If it weren’t for the boat ride on the property or the array of restaurants that beckon, I would’ve spent the rest of my trip indoors. Supper is organised at Il Mare, labelled as the best Italian restaurant in Sri Lanka. I try the seafood platter and pizza, but it is the crumbling chocolate panna cotta with gooey raspberry that is reason enough to return. 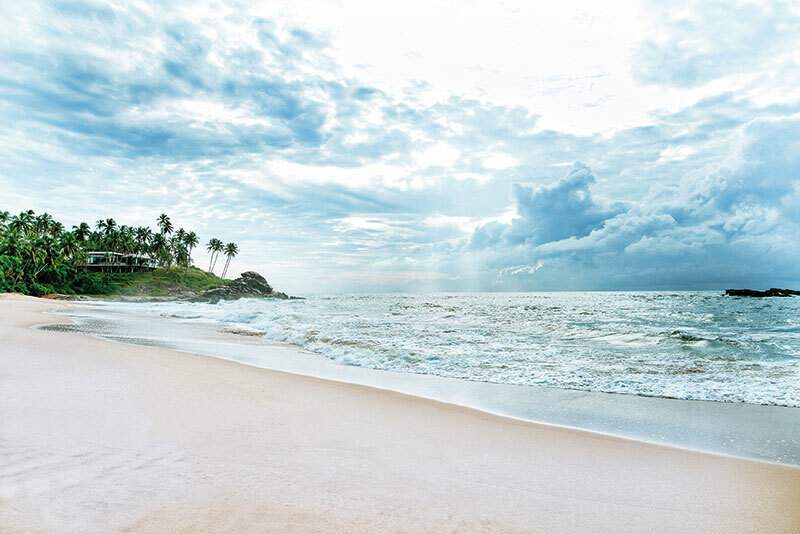 Mornings at Anantara Tangalle begin with Surya Namaskars on the beach front. I skip the yoga session for a visit to the Elephant Transit Home (ETH) and a safari at the Udawalawe National Park. I am accompanied by my driver, Fernando, who tells me about his life in government service and gives me the lowdown on the current political scenario. He tells me how in the last six years, they have succeeded in reestablishing tourism here. All of a sudden, our conversation is brought to an abrupt halt, as is the vehicle. We are on the Thanamalvila bridge and Fernando points to a majestic elephant on the bund of the Udawalawe reservoir. He has been christened Rambo and is popularly known as the begging elephant. He came from the forest almost 15 years ago and never returned. For a very long time, visitors would park their cars and feed him at the bund until he was diagnosed with diabetes. The Wildlife Conservation Department has stepped in, making sure feeding activities in the area are banned. Nearby, ETH or the elephant orphanage is an organisation that rescues animals. They feed baby elephants till they are four years old before sending them into the forest or national park. I watch the enormous creatures in this stunning setting, with Fernando giving me a brief history of their lives. One story really stands out. An elephant lost his hind leg in a mine explosion, and has been given refuge at this shelter. With the help of donations, the ETH fixed him a false limb, and he can be seen today hobbling with the herd. I spend the remainder of my day and the last of this trip in the company of some great food at Verele at Anantara. I am most satisfied by cassava chips served with edamame; Google tells me that they are a spicy version of tapioca. One of the staff rushes to get me a packet that I can take back home. If my family or friends were in tow, we would have hollered and marvelled at these lasting impressions. But alone, my eyes well up. I think about the elephants — a sign that I should get out more often, and remain open to spectacular encounters. Especially if it means doing it solo.